Why are we wrecking our best modernist landscapes? - Archpaper.com Why are we wrecking our best modernist landscapes? This is a feature article from Issue 8 of The Architect’s Newspaper. If you’ve seen the movie Columbus, you’ll remember, among all the nerdy dialogue about modernist bank branches and James Polshek’s buildings, that scene where the two protagonists passionately discuss the Dan Kiley landscape outside the Eero Saarinen–designed Miller House. That’s because landscape architecture, though intrinsic to the experience of some of the best modern buildings, rarely gets the conversation it deserves. Despite being featured in all the film’s promo shots, the landscape by one of the last century’s best landscape architects got zero shout-outs. This snub, brought to light by the Cultural Landscape Foundation Executive Director Charles Birnbaum in a Huffington Post op-ed, reflects larger attitudes toward landscape architecture in the United States. It’s a long-held and frequently heard complaint inside the discipline that even successful landscapes by the very best designers are treated like scenery for architecture. While New Yorkers love Central Park, concrete plazas between modernist skyscrapers—even though they are essential to the experience of the buildings themselves—don’t elicit the same joy. Modern and late-modern landscapes in American cities are the least appreciated and least understood outdoor spaces, though they shape day-to-day experience in the contemporary American city more than leafy 19th-century destination parks. These modern spaces contrasted with—and challenged—the platonic ideal of the American urban park, established by Frederick Law Olmsted and largely unchanged since the 1860s. Urban renewal gave designers the opportunity to think up supersize projects (New York’s Lincoln Center for the Performing Arts, Boston’s Government Center, Pittsburgh’s Gateway Center, Philadelphia’s Penn Center) that afforded new ways of experiencing space and the city. Instead of offering the faux-countryside, 20th-century designers summoned concrete and right angles to create dynamic public spaces rooted in modernist functionalism. In the postwar years, as industry abandoned cities en masse and corporations moved white-collar workers to lush suburban campuses, cities and captains of industry commissioned the best landscape architects in practice to activate declining downtowns with plazas and parklets. 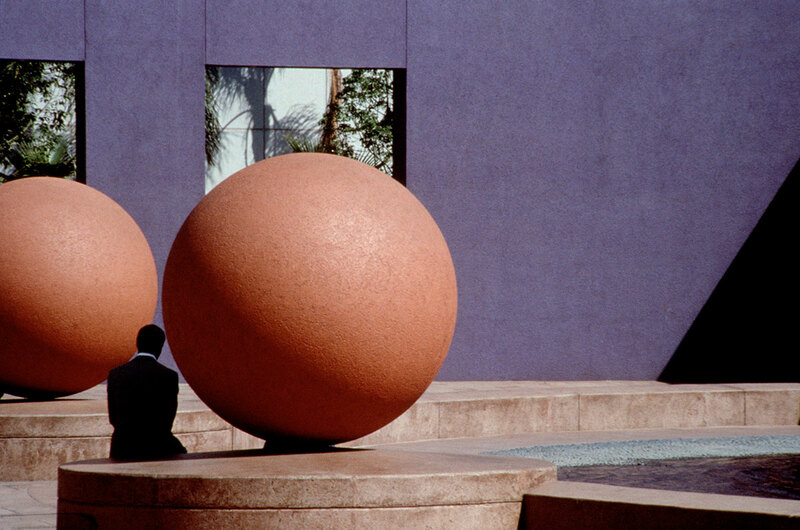 In smaller urban projects like Heritage Park Plaza in Fort Worth, Texas, Fountain Place in Dallas, and Peavey Plaza in Minneapolis, designers like Lawrence Halprin, Kiley, and M. Paul Friedberg offered contemporary city experiences that both responded to and represented these profound changes in the American urban form. This not only applies to plazas from the boomer or Gen X era, but to Millennial landscapes, too. 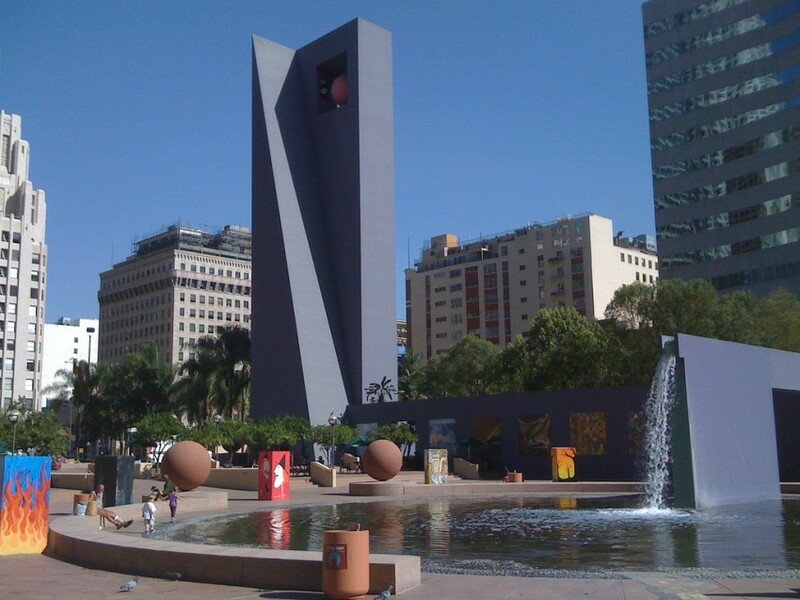 Just as chokers and platform sandals are cool again, designers are expressing renewed interest in successful 1990s postmodern landscapes, like Wagner Park or Pershing Square. Despite their significance, these parks are now threatened by thoughtless development. Unlike their forbearers—most of which were baked into city plans or carved from large swaths of open space—modernist landscapes like Freeway Park in Seattle shaped vestigial areas, harnessed from leftover space (like vest-pocket Paley Park in Manhattan), or repurposed former industrial land (Ghirardelli Square in San Francisco). 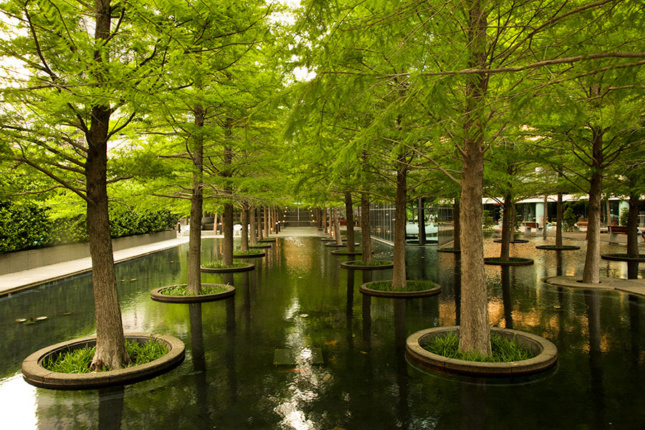 In their comparatively tiny areas, designers deployed textural materials like concrete, gridded trees into mini urban forests, and masked obtrusive city sounds with water features. Despite their historic significance, these sites are constantly imperiled by bad maintenance, and the public antipathy that follows—“What’s with all that concrete, and where are all the flowers?” While it can take decades for an artist’s work to be appreciated, as Halprin noted, landscapes and the land on which they sit are often at the mercy of changing real estate interests and don’t have time to mature in the public perception. Though some, maybe most famously Boston’s Government Center, are wildly unsuccessful and are being (sensitively) adapted right now, many upgradeable landscapes whose potential could be teased out with thoughtful changes are instead being plowed over with heavy-handed schemes that dishonor the original design intent. Maybe because they are underappreciated, many postwar urban parks and plazas are threatened by market forces and dumb human decisions: out-of-place nearby development, revamps that turn parks into front lawns for speculative real estate, rising downtown land values, and, paradoxically, resilience measures that anticipate future coastal flooding. Compared to buildings, landscapes have fewer protections afforded to them. 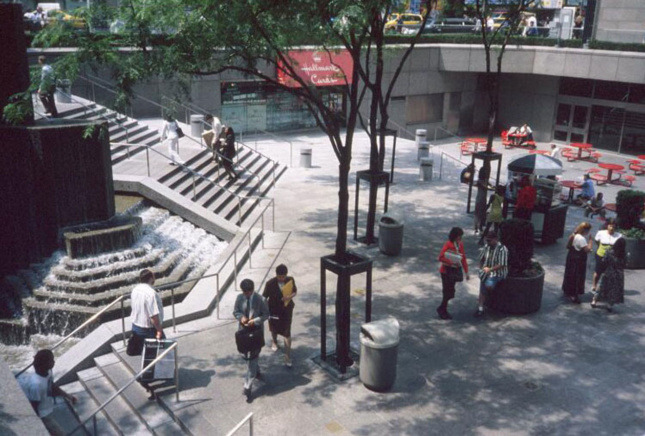 Since June, there’s one less: The New York City Landmarks Preservation Commission approved the demolition of a Sasaki fountain and plaza that anchored the base of Citicorp Center, a suave Hugh Stubbins–designed 1970s angle-topped tower on Lexington Avenue at 53rd Street. The architect would faint if he were around to see the flowerbeds proposed for the base of his building. Though developments like these can be jarring, the cities around these landscapes have changed substantially, too. After fleeing in the mid-20th century, people and prosperity have returned to cities. Though regional development is always uneven, there’s a persistent and widespread demand for walk-to-work neighborhoods with a healthy mix of day-into-night life. Downtown is hot. And tastes have changed, too. As megaprojects like Hudson Yards and smaller regional ones like SWA’s San Jacinto Plaza in El Paso, Texas, demonstrate, there’s a desire for more programmed space, with Ping-Pong tables and colorful, interactive public art. These landscapes reflect a turn from urban production to urban consumption; though the social life of these public spaces still includes people-watching and book-reading (or phone-staring), spaces are increasingly programmed around shopping, tourism, and scenery that’s good content for Instagram. Planners today promote infill housing and mixed-use everything, so visitors to these downtown parks are, increasingly, residents too. Outside of a few true classics that have never lost their luster, how do modernist landscapes fare against their newer predecessors? For this feature, we chose some of the notable urban landscapes of that era currently under redevelopment to assess where they are now, and how they’re being adapted—or not—for the future. Their designers never intended for their landscapes to be built and forgotten. There’s little to love in badly patched concrete, treeless planters, or dry fountains. We’re looking anew at famous landscapes by the best of the best and at those that are less familiar. Some honor the landscape architect’s original design intent, while others…don’t. Preservation isn’t about ossifying landscapes in some vintage ideal, but framing updates around the original design intent. Across the country, designers are looking at landscapes with consideration of their significance while adapting them for contemporary knowledge of ecology, accessibility, and programming. In a May 2017 talk at the National Capital Planning Commission in Washington, D.C., Elizabeth Meyer, professor of landscape architecture at the University of Virginia, explained why landscapes of the 1950s through the 1980s are significant today: They are a record of postwar modernization and urbanization, and they should be reimagined—not cast in amber—for the 21st century. “Adapting modernist landscapes does not require demolition and redesign,” Meyer said. Just like the designers who revamped the 19th-century city park in the 1970s, these projects will need careful updates for today’s users, made with intelligent materials, to facilitate life in the present while looking back to history, not to pickle the past but to energize urban life.